Do places on Earth exist where annual records have been stored for tens of thousands of years and can be accessed today? Ice-cores and tree rings can preserve long records of yearly events but some of the best records come from layers of sediment underlying some lakes which, if formed under the right conditions, can be read like the annual rings of an oak tree. These alternating layers of sediments and sometimes organic material are called varves and by counting each varve sequentially a varve chronology can be constructed. Varve chronologies are a window to the past and have been used to study past climate conditions, the periodicity of volcanic eruptions and as an independent test of radiocarbon (C14) dating methods. One place were varves have been studied for decades is below a deep lake in Japan: Lake Suigetsu. Here a varve chronology stretching back well over 50,000 years has been established. An important summary of the significance of this varve chronology can be found in an open access article from Science here with a summary from Nature magazine here. For several decades, varve chronologies have been featured as clear evidence of an ancient Earth. The evidence from varves presents a formidable challenge to young-earth creationists (YECs) and their assertion that scientific evidence, properly interpreted, points to a young earth. Though a well-worn example, this recent work pushing the varve chronology to close to 60,000 year bears reviewing in light of how YECs have responded in the past to this challenging data. Below I introduce you to the varve deposits in Japan and then review how young earth creationists have responded. Why is Lake Suigetsu a good place to examine varves? 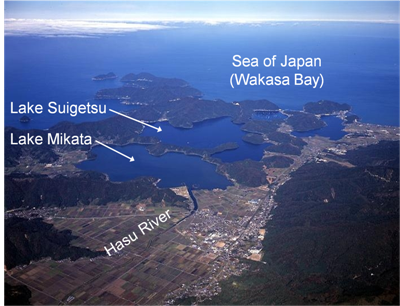 Lake Suigetsu is one of five lakes that were formed from volcanic eruptions. The reason this lake was targeted for study is because scientists are fully aware of the potential errors that may occur when assessing whether the varves they see truly represent annual layers. This lake has all the features that one could hope to find in a location to avoid those problems. Annual varves are the product of changes in the composition of sediments and organic material deposited in spring and summer vs the fall and winter. New input of sediments to the lake floor is derived primarily from material falling into the lake from the air (leaves, pollen, volcanic ash, dust) or from differential growth of organisms (algae) over the year. What is amazing about most of the varves of Lake Suigetsu is that as one moves down the cores retrieved from below the center of this lake, the varves formed in the past several hundred years for which climatic and lake-conditions are known look similar to those formed 10s of thousands of years ago. This provides researchers with increased confidence that the varves represent annual years and that the climatic influences on this lake in the past have been very similar to those of the present. How do varves form in this lake? including by eye and by computer assisted techniques and more recently by various scans of the cores using other methods of imaging which highlight differences in organic content which can accentuate the winter season layers making the reads more accurate. Careful, independent counts of the annual varves have been performed and more than 800 samples of leaves and other organic content (pollen grains etc..) have been selected from the cores for carbon 14 dating. In addition, 40Argon/39Argon dating has been performed on tephra (ash) layers found in the cores sections (see picture to the right for an example) and two other types of dating methods have been performed on the cores. See the Science article for details. In addition, papers about varves and chronology around the world can be found in this issue of Quaternary Science Reviews. So many different tests of the annual nature of the varves have been conducted here because these varves play a critical role in calibrating the radiocarbon (C14) clock. The methods and results published in dozens of papers have been scrutinized by hundreds of other scientists and the varves counts continually remade to test their accuracy. As a result of this high level of scrutiny the scientific community is confident that the varve counts have a high degree of accuracy and they represent individual years. Varves and C14 dates of organic material taken from the cores plotted against depth of the core. The correlation of C14 dates and varve counts is either in incredible coincidence or are corroborating the validity of each other. This figure is from a 1994 publication and so represents one of the early studies from this site. Much more detailed analysis continues to support the findings reported here. What are the data derived from Lake Suigetsu? Initial studies in the early 1990s from the first cores below this lake found a tight correlation between varve count date (the number of varves) and radiocarbon derived dates of organics in the layers stretching all the way back to 40,000 varve years. As you would expect, there is also a strong correlation of age with depth of the column (see figure to the right). The most recent analysis reported in Science expands the varve counts back to more than 50,000 years. Over 800 samples of organic material have been C14 dated and each of those has been sent to at least two – and sometimes 3! – radiocarbon labs for independent verification of the C14 dates. The incredible rigor in selecting samples for C14 dates and blind testing at multiple labs has been undertaken because one of the primary goals of the Suigetsu varve counting group is to confirm the accuracy of and calibrate the C14 clock. Consider also that there are more than 30 visible ash layers which form discrete almost pure glass crystal layers that lie between varve layers. These would have formed from airborne ash from volcanoes in the area. That ash would have fallen directly into the lake surface and settled quickly to the bottom. Had this ash been brought in by the river it would have been mixed with other sediments. These ash layers further attest to the fact that this lake had clear undisturbed waters during the whole period that these varves formed. In addition to the 30 visible layers there are at least 100 additional ash deposits that are so fine that they can only be identified by microscope. These represent ash from very distant or small volcanic explosions that brought a very small amount of ash fallout to the lake. The advantage of having ash deposits in the varve cores is that it is possible to radiometrically date them (Smith et al. 2013) and those dates can be compared to the varve counts. If either radiometric dating or the varve counts were inaccurate measures of the time – ie. a bad chronometer – then the two dating methods should yield inconsistent results. 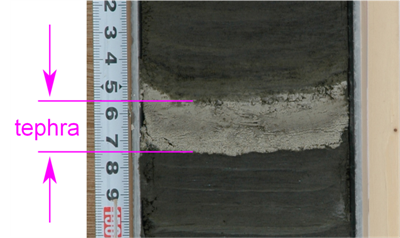 Multiple ash layers in multiple cores have been dated by several radiomentric dating methods and those dates are consistent with the varve counts. For example, an ash layer found at varve count 9000 yields a radiometric date of around 9000 years. This correlation of varve counts with radiometric dates represents yet another independent verification that both the varve counts accurately reflect the passage of time as annual layers. Over the years there have been multiple cores taken from the lake bottom which have had their varve layers counted multiple times by multiple methods by multiple investigators. C14 dating has been performed by independent groups over the same time. If we combine these data with data from varves from other locations and tree ring data, a very compelling and consistent chronology of Earth’s history can be observed extending back a minimum of 50,000 years. Below is a composite figure showing the relationship of tree rings, varves and C14 dates compiled from multiple studies from different locations in the world. What we see is an amazing correlation of these data points. The graph above is a summary of comparison of carbon-14 activity with tree rings and with lake varves from Lake Steel in Minnesota and Lake Suigetsu in Japan. It was prepared by geologists Davidson and Wolgemuth. Notice that as one moves deeper into the sediments of a lake (varve data) that the total amount of C14 gradually declines. There is no abrupt break in C14 concentrations suggestive of large changes in radioactivity in the past as predicted by some young-earth creationists. Dr. Reed simply asserts that rapid sedimentation can cause the appearance of varve like layers which could be mistaken as annual years when they really represent catastrophic deposition over a very short period of time. He also reports in several other articles examples of lakes and other fossil varve sites (ancient preserved lakes with varved rock such as the Green River Formation) where there is evidence of multiple varves produced in a single year. This defensive strategy employs redirection. By either implicitly or explicitly that because known exceptions of varves representing individual years can be identified, then all reports of annual varves should be discredited. These responses are nothing more than accusations that the assumptions are incorrect and that scientists are unwilling to consider alternative means by which these tens of thousands of layers could have been formed. But, this is exactly why the Lake Suigetsu cores have been scrutinized by so many scientists. Scientists are well aware of that annual varves require specific condition to form. They picked this location because the conditions there do not violate any of those conditions. They have used multiple methods to test for annual periodicity. They have assumed nothing and only after passing all the tests have they stated that the varves under this lake represent annual varves. “The first example is the “varved” (finely layered) sediments of Lake Suigetsu in Japan. Apparently, the varves present a “record” of 100,000 years, reinforced by C14 dating and dendrochronology. And of course, once the lake sediments have blown away the creationist position, the authors can then point to the rock record beneath the lake as “proving” millions of years. This is a short response by Dr. Reed. However, he also produced a longer more technical-sounding line by line response to the same article. I don’t really need to review that response because it doesn’t provide any new responses. He simply throws out the same doubts about c14 dating and varves and claims that these scientists haven’t been willing to consider alternatives. But what alternatives does Dr. Reed provide? He asserts that links to other articles provide demonstrations that varves and c14 doesn’t work. But is this true? His linked article that presumably demonstrates that varves are not valid is to a paper by Michael Oard. But that paper doesn’t have anything to do with the Suigetsu varves or the type of varves that are found there. I’ve read all of Oards’ refutations of varves and they have little to do with reality. Rather they include the same hand-wavy assertions that Reed uses: one lake has layers that aren’t annual years that this casts doubt on all other layers in other lakes around the world. Does he really think that scientists are so ignorant of these assumptions and are unaware of variables that can cause varves to be unreliable? Scientists have found many varve records to be unreliable chronological markers, precisely because they really do understand that there are conditions that must be met to reliably interpret varves as annual layers. Dr. Reed wrote yet a further response to the same old-earth article (see references). In it he provides no further evidence that the Suigetsu varves are invalid than he does in his article from 2008. I find it very difficult to find much charitable to say about Dr. Reed’s responses and attitudes. Of course he is upset that his beliefs about a young earth are being challenged but he is supposed to be a PhD geologists capable of critically analyzing and demonstrating the faults in interpretations of old earth geology. What we get instead is nothing but name-calling rhetoric. He faults scientists including other Christians for not considering the alternatives and yet provides no other alternative himself other than a generic appeal to a global Flood without offering any mechanism that could explain the observed facts. I have spent many hours reading the original literature about these varves. These article include extensive discussions by the authors about why they believe the varves represent annual layers and not just individual events layers as are seen in some other lakes in other parts of the world. What has Dr. Reed done to respond to the Christian geologists who have used the Lake Suigetsu varves as evidence of an old earth? Apparently he hasn’t done them the courtesy of reading the original literature himself. Rather he responded with generic arguments that apply to some varves but not the ones that are being held up as the specific challenge. Yet he confidently claims they must be wrong! Does Dr. Reed or Michael Oard address how discreet bands of ash can be found between 10s of thousands of fine bands they believe must have formed in a matter of months or just a few years? I haven’t even seen Dr. Reed even acknowledge to his audience that such bands of ash exist in these varved layers! His strategy, like so many other creation scientists, seems to be to simply proclaim as loudly, as boldly and as confidently as he can that there is an alternative and to make fun of scientists for not being able to see the real truth that he sees. It’s all preaching to the choir. He has no interested in providing a reasonable alternative explanation for the data. Rather he only wishes to provide enough doubt in his audience’s mind that they will not explore the evidence any further. Young earth creationists have had 30 years to construct a plausible hypothesis to explain these and other annual varves. The fact that they are still just waving accusations and vague generalizations around is a clear sign that they know that there is no alternative. What we are seeing here is reminiscent of observations that I made in my post: Having Faith in Flood Geology: Dogmatic Assertions of Evidence. Summary: Varved sediments underneath lake Suigetsu provide powerful confirmation that this lake has existed for 10s of thousands of years in a state very similar to what we observe today. A recent global flood does not provide a viable interpretation of the same evidence. Addendum 8/19/2016: The 60,000 from the title came from popular reporting from when this research was first reported. The reported varve counts, which are considered reliable annual varves, only go back to just over 53,000 years. But there are varves potentially reaching back to 150,000 years below this lake but the lower layers can’t be read with the same accuracy as the upper 50,0000. Berthault, G., Experiments on lamination of sediments, CEN Technical Journal 3:25-29, 1988. JK. Reed. A response to the Old-Earth advocacy of Campell et al., PCA geologists on the antiquity of the Earth. Published in Answer in Depth at the Answers in Genesis website. Nakagawa, Takeshi, Katsuya Gotanda, Tsuyoshi Haraguchi, Toru Danhara, Hitoshi Yonenobu, Achim Brauer, Yusuke Yokoyama et al. “SG06, a fully continuous and varved sediment core from Lake Suigetsu, Japan: stratigraphy and potential for improving the radiocarbon calibration model and understanding of late Quaternary climate changes.” Quaternary Science Reviews 36 (2012): 164-176. Schlolaut, Gordon, Achim Brauer, Michael H. Marshall, Takeshi Nakagawa, Richard A. Staff, Christopher Bronk Ramsey, Henry F. Lamb et al. “Event layers in the Japanese Lake Suigetsu ‘SG06’sediment core: Description, interpretation and climatic implications.” Quaternary Science Reviews 83 (2014): 157-170. Smith, Victoria C., Richard A. Staff, Simon PE Blockley, Christopher Bronk Ramsey, Takeshi Nakagawa, Darren F. Mark, Keiji Takemura, and Toru Danhara. “Identification and correlation of visible tephras in the Lake Suigetsu SG06 sedimentary archive, Japan: chronostratigraphic markers for synchronising of east Asian/west Pacific palaeoclimatic records across the last 150 ka.” Quaternary Science Reviews 67 (2013): 121-137. Staff, Richard A., Takeshi Nakagawa, Gordon Schlolaut, Michael H. Marshall, Achim Brauer, Henry F. Lamb, Christopher Bronk Ramsey et al. “The multiple chronological techniques applied to the Lake Suigetsu SG06 sediment core, central Japan.” Boreas 42, no. 2 (2013): 259-266. It wasn’t my intent to cover the the entire geological context of the cores. The 73 meter combined core reaches down to the rock below. This would have been a mix of sedimentary and volcanic rock that formed when the volcano erupted and formed these craters. Below these craters and thos volcanics are more sedimentary rocks. The 73 meters at a minimum must be explained by YECs as post-flood deposits. The volcanoes would probably be considered post-flood and thus the material in the crater post-flood. The 60,000 varves do not account for the entire column. The bottom 30 meters are organic clays with no clear varves probably because the lake was more turbid at the time. Dating suggests that the lake was formed after eruption about 200,000 years ago. You probably also saw this. YECs clearly aren’t interested in evidence for its own sake – yet falsely pretend that for their opponents what really counts isn’t evidence but ‘worldview’ and ‘wrong’ assumptions resulting from their anti-god or anti-creationist bias. I always enjoy your posts, and I usually learn a lot. This post reminded me of an article I read some time ago by Paul H. Seely. It is about the record in the ice cores. I found it very compelling (though the language of the title “Ultimate Proof” is overly strong). I was wondering if you had come across it. Seely is not a scientist, but an OT scholar, though he had some help from some mainstream glaciologists. Hi Ben, Thanks for your comments and the link to Seely’s article. I have a thick folder with everything that Seely has written on science/faith including his book on inspiration. I have greatly benefited from his work. The ice core data is quite compelling but there are so many nuances to really understanding the differences in cores from various locations, how ice compacts over time, that there can be melting at the surface before addition of new ice and so forth. The result is that although it is compelling evidence to those that have spent a lot of time reading about or working with that data it can be hard to communicate simply without opening oneself up to criticism because of details left out. I think Seely does a very good job in those article though I agree that I prefer not to use the term “proof” since in science absolute proof is not the object. The ice core evidence does leave little room for doubt though that long periods of time are represented in these cores. I just want to say that I love your articles and the research your share on this blog. Also I have nominated you for the coveted Food for Thought Award. Please, check out the below post for details. May God shower His Grace on you! I thoroughly enjoy everything that you’ve put in this post and others. You do excellent work indeed – Informative, reserved, with just a touch of your own view on the subject that adds only to the effect of your writing. I thank you very much. Excellent post, thanks. The varves were used to callibrate the C14 method. But even without callibration, the C14 concent is clearly going down along the varve column. So from the young earth perspective, if there are multiple varves per year (and you’d need a LOT per year if all varves are post flood), these should be matched by an increase in C14 halflife. So if one could find a mechanism for ceating multiple varves, one would als need to speed up C14 decay (and not let the lake evaporate by the heat of accelerated nuclear decay). This all sounds implausible, or rather: impossible. Thanks Rene. You are exactly right. Young earth creationists will say that varves can form in multiple per year or even per storm and give examples of someplace where that has happened. But context is critical. Just because there are things that look like varves that can form multiple layers in a short time period does it mean that all layers were formed that way. Here multiple lines of evidences support each varve representing a year and the c14 data is especially good. Your right that there has to be some sort of miraculous coincidence of C14 decay and multiple varves for this data to work in a young earth perspective. It really is beyond implausible as you say. Just a question, does the statements in the blog I am referring to contain truth, as in the are no more sediments being done on a annual basis? Sorry for the late response, I’ve been out of town for a few days. I am not sure if varves are still forming. I would expect they would be if it is shown that that they are not forming today I would not be shocked given changes to climate and the influence of humans on the water quality (which would effect bloom cycles of plankton thus making the varves less obvious). There must be sedimentation still occurring in those lakes but those sediments may not have a distinct summer/winter characteristic in recent times. If I remember my interview with prof. Van der Plicht (one of the authors on the paper) correctly, the analysis did not count the recent varves, simply because they were not needed. The purpose of the study was to obtain a better callibration curve for the 25.000 + year region. By grafting the varves to known phenomena, they could get an accurate starting point without counting the most recent layers. I see no reason why there shouldn’t be any varve formation right now. There’s still summer and winter. The varves (again, from memory) were deposited by algae blooms. Yeah, that makes sense. I am not familiar with the lakes myself so could not speak directly to the data but it would be surprising if varves should not be still formed given the lakes of quite deep and so disturbance in the middle of them should still be very limited. The　Urami　Cannal，　by　which　Lake　Suigetsu is　connected　to　Lake　Kugushi，　was　constructed in　1664．　Prior　to　the　completion　of　the　channel， the　effluent　from　Lake　Suigetsu　flowed　down into　Lake　Kugushi，　skirting　around　the　edge　of the　east　mountain　range　of　the　lake　group．　The lake　surface　of　Mikata　and　Suigetsu　was　about 10　m　higher　than　it　is　now．　With　the　completion of　the　channel　and　the　lowering　of　the　lake surface　to　its　present　level，　the　surrounding areas　of　Lake　Mikata　and　Suigetsu　were　left dry．　Saline　water　began　to　intrude　into　the deepest　part　of　Lake　Suigetsu．　A　two－layered system　of　a　deeper　saline　water　covered　by　a less　saline　upper　water　was　formed．　ln　1801，　the Saga　Tunnel，　by　which　Lake　Suigetsu　was connected　to　Lake　Hiruga，　was　constructed， but　later　it　was　partially　buried．　ln　1934　and 1935　the　Saga　Tunnel　and　the　Urami　Cannal were　repaired and　enlarged　for　flood　prevention （the　Saga　Tunnel：　145　m　long，　5．5　m　wide， 1．8　m　deep；　the　Urami　Canal：　380　m　long，　14　m wide，　1．3　m　deep). on the radiocarbon dates from 0 – 12,000 years, https://journals.uair.arizona.edu/index.php/radiocarbon/article/view/12340, but I can only read the abstract which describes the upper layers as ‘largely unvarved’. But it doesn’t matter a great deal to the conclusions of the Science paper. 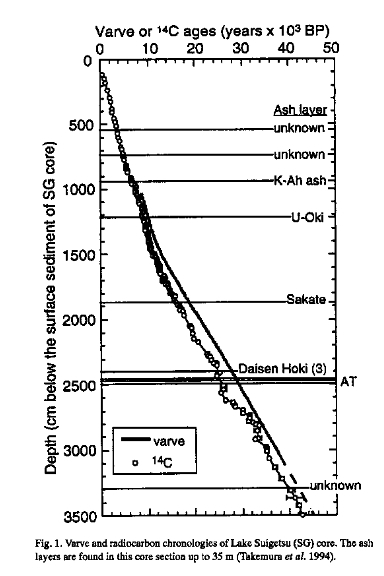 The floating time line (from 12,500 to 40,000) has been grafted firmly into the known callibration curve, and there are multiple comparisons with other carbon-14 timelines (stalagmites). If the formation of varves has stopped because of a channel dug in the 17th century, this has no impact on the earlier varves. The article is logic and reasonable, it’s strongly convincing that the varved chronology in lake suigetsu verified well the radiocarbon dating. However, there are several supplementary things I want to know: Firstly, there is about 85 articles on the website of suigetsu project, where are the others, as well as the publications which confirmed the environment of annual layer deposition? Then, I didn’t find the article presenting the blind independant dating of sediment samples at the same time, if it doesn’t bother you, could you indicate which publications are talking about that? Finally, I wonder if there is only about 30 specialists working on this interdisciplinary research, where are the other persons? Thank you very much for the useful indications!